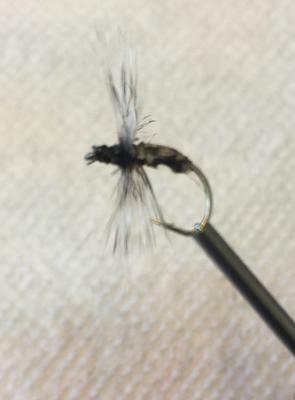 I was inspired by the Mamushi Kebari to tie some rattlesnake flies. I am not sure if I would fish with a fly that costs almost $20.00. Thanks to some insight from Chris, I was able to tie the first one with the belly scales just like the Mamushi Kebari. We have lots of Rattlesnakes in Idaho! The first fly is tied on a Gamakatsu Amago size 7.5 hook, grizzly hackle, and black silk thread. The second is tied on an Owner size 4 Tenkara hook, using the darker scales. They were easy to tie. On my way home from shooting some sporting clays, I stopped by Marsing pond and caught two 12 inch planters on each style. The flies worked well, and I was the only one who caught any fish in the half-hour I fished. The Suntech GM Suikei Keiryu Special 44 is becoming my "go to" fly fishing rod. You can find rattlesnake skin on the internet for a fairly reasonable price. According to Chris, the best part to imitate the Mamushi Kebari comes from the belly scales. Most rattlers are cut up the middle of the belly. That said, I found the second fly with the darker scales to be taken very aggressively too. I am looking forward to doing more experimenting with snakeskin flies. Has anyone else tried them? Fish skin? Interesting concept, catch a fish on a fly tied with the skin of the same fish. An interesting question to ponder when using snake or fish skins on a fly..... Does using snake/fish skins take the fly out of the "fly" category and put it into the "bait" category? Hoppy - I don't think it makes it "bait" anymore than feathers from a chicken or hair from sheep that many of my flies are tied with make them bait. To me, bait is something more organic in nature rather than a way to fool the fish to take an imitation of something. The pictures of these flies don't do them justice. Most important, the fish seem to like them. Second, they are easy to tie. Third, materials are relatively easy to get and inexpensive. Fourth, I am looking forward to trying them on some of the more pressured waters in my area since I doubt the fish have ever seen them before, and may be less wary to take them. Zonker strips (rabbit or squirrel skin) aren't considered bait, so rattle snake skin shouldn't be either. Now, down to the nitty-gritty..... Is the snake skin tanned? If it is not tanned, then it will ooze snake skin oils into the water and make the fly more attractive than just the texture and the coloring of the skin would on their own. And, as the Good Bard tells us, "therein lies the rub." If the fly is scented, it no longer falls under the "artificial fly" category and becomes either a "lure" or a "bait." There are horror stories of fisherpeople being cited for even spitting on a fly (as you used to spit on your worms). Personally, I like to keep my conservation officer at a rod's length and do not want to become any more closely acquainted with him/her than that. Okay, litmus test time..... Setting: Offshore Hawaii, 30+ fathoms of water, saltwater flies being used and not catching much. Your guide whips out two, pre-cut pieces of mahimahi skin strips and whip-ties them to each side of the fly, increasing the catch rate ten-fold. Are you still fishing a saltwater fly, or are you fishing bait with some hairy/furry stuff on it? I think that it does not take much imagination to see where a conservation officer would consider a snake/fish skin fly to be the latter, especially when it would be next to impossible to convince said officer that the snake/fish skin was tanned and was not chumming the waters with scent. And the onus of proving differently would fall on you and not on him/her. Playing at being the Devil's advocate here, Chris and Les, but I also don't want to have you calling me to go your fine/bail. Ha! Hoppy your are RIGHT. I thought you were just being a smart aleck. I know Fish and Game folks are sometimes hard to please. One game officer would carry dental floss and if you were fishing in a barbless area and the floss caught you were caught! animal or vegetable matter, or scented synthetic materials." This rules out a lot of flies!! Fly Fishing is defined in the Idaho regulations as "Fly-Fishing: Fishing with a fly rod, fly reel, fly line, and artificial flies." By this definition, Tenkara fishing isn't fly fishing even if you use flies. I have asked for a clarification from Fish and Game, and have not heard back from them yet. There are several steams I would like to fish with my fixed line rods and flies that are "Fly Fishing Only." Thanks for looking out for me, Hoppy. More and more, Les, it seems like a fisherman's best friend is the lawyer who he has for a fishing partner. What got me thinking about this topic was Ron's remark about using fish skin to catch a fish. Most state regs are quite explicit when it comes to using fish parts for bait. Here, we can only use "eyes, gills, entrails, and scales" as bait. As to using snake skin flies, they would be outlawed in SD where "organic bait" is outlawed on certain waters. They might be legal under the category of "artificial lures" on other waters, but you would want your best stream-side buddy with you when you fished them. Glad to have saved you from spending a night in the hoosegow, Les! I talked to my friend Daniel who works in law enforcement for the Fish and Game service. (He is one of the good guys!) He told me that in a strict interpretation of our law, any flies tied with wool, such as the Utah killer bug are "bait." If it was tied with a synthetic material it would be OK. Muddler minnows or any fly tied with deer, elk, or antelope hair are "bait." Zonkers or any fly tied with rabbit strips are "bait." Hairs ear nymphs are bait! He also informed me that he would be surprised if anyone in his department would enforce such a strict interpretation of the law. I showed him my new "rattlesnake" flies. He told me that any officer that asked to see one of those flies on the water would just look at them and consider them to be a fly. If it was a barbless area, would check the barb, and let it go. If I had a trailing piece of rattlesnake, I would be in trouble. His advice was to show the officer the fly and keep your mouth shut. That is my rule of thumb anyway. I have been in court for challenging fishing laws. The 20 plus miles of the Fly Fishing Only section of the Umpqua river is really controlled by a fishing club called "The Steamboaters." They got a rule changed that you couldn't fish weighted flies in this section. Most of us fished weighted wooly buggers. My daughter was into beads, so I began tying lead crystal bead buggers. I argued that the beads were the body of the fly and I won in court. Talk about a spendy fly to tie! Lead crystal beads are not cheap. Daniel is working on getting Tenkara approved as a fly fishing method in Idaho, so there is no ambiguity in the law. I told him, I would carry a reel in my vest or backpack, just to be covered and he laughed! I was checked twice on the South Fork of the Boise river this winter (fly fishing only), and both officers were intrigued by the method. I was fishing with my Suntech Keiryu Sawanobori 63. It is an awesome fly rod. They didn't challenge that it wasn't fly fishing. They didn't challenge that my egg fly was tied with "Mimosa" Jamieson's Shetland Spindrift WOOL! I have a real problem with Fly Fishing Only regulations that specify the equipment that must be used. If they specify that a fly must be used, fine, I can understand that to preserve the fishery. How the fly gets delivered to the fish has no impact on the health of the fishery! Specifying that a fly rod, fly reel and fly line must be used is only an attempt to preserve fly fishing, not the fishery. "Fly fishing" does not need legal protection! Actually, it is really an attempt to reserve the best water for "fly fishermen." It is pure elitism and pure garbage, and I would not be surprised if a court challenge could get all similar laws thrown out as unconstitutional under the "equal protection" clause. The Missouri Department of Conservation considers fly fishing to be based on the thing in the water with a hook. It doesn't matter how you deliver that thing to the water, you're fly-fishing if that thing meets certain criteria. Hence you will see many people in fly fishing only zones with spinning rods and jigs. Heck, you could use a baitcaster, a giant lead sinker and as long as the thing at the end of the line meets the definition of "fly" you're fly fishing. I believe it's all about how likely the bait/lure/fly is to lead to fish mortality. Bait and soft plastics are considered to be most likely to lead to mortality, multipoint hooked lures less so, and flies even less so. Fly—An artificial lure constructed on a single-point hook, using any material except soft plastic bait and natural and scented bait as defined in (A) or (B) above, that is tied, glued or otherwise permanently attached. So all the squirmy worm haters can rejoice, you can't use them in "fly fishing only waters"in Missouri. However, I suspect those same folks would be appalled by the spinning rods and "crappie jigs" being used there. Jeff, I think that's the way the regs should be written. Their decision is based on science rather than emotion, and on what is best for the fishery. I applaud them for it! Firstly, cool flies. (And I DO consider them flies.) Very creative. I thought I was a fly tying purist, but damn, some of those interpretations are just crazy. Do these states just ignore the fact that almost every fly ever tied before very recently (synthetic fibers) used bug guts to lash feathers and wool to a hook? The first fly ever documented was red wool. I'm just happy that Montana just uses a very broad "artificial lures" definition. Every fish cop I've met here has been very friendly. I've even had a few ask to cast my tenkara rod.